Emily has had her share of personal struggles. Her mother suffers from a debilitating mental illness and has been placed in a sanitarium. When Emily, her father, and two sisters move to a new home, she becomes the target of derision from the students at her new school. Nothing makes Emily more uncomfortable than to be at the center of attention. Above all she simply wishes to fade into the background . . . to be invisible. So it pains Emily that her gym teacher is on to her. He is keenly aware of her outstanding ability to run, and fast; and he's bent on getting her to join the track team. She wants nothing to do with organized sports. So when Edin, another new student at school appears to be the only person capable of beating her, he challenges her to give the track team a try. But her natural instincts are to push him away, as she does with everyone and everything in her life. Lessons in Saving a Girl, by Leighla Graham, is a refreshingly honest glimpse into the life of a family trying to find a semblance of normalcy in the midst of their frenzied existence. Free of pretense, this book exposes the stains caused by mental illness as it tarnishes the lives of those in its wake. Graham is a gifted writer whose style is as fluid as it is direct. 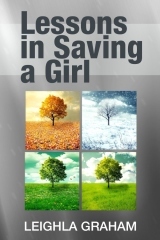 Her book, Lessons in Saving a Girl, offers a glimmer of optimism wrapped up neatly within this affecting story which is sure to resonate with readers of all ages.